Berlin Self-Drive Trabi Safari Tours depart daily all year round. Departure times are at 10.00, 11.30, 14.00, and 15.30. Book the earliest tour to avoid crowds during peak season. We are comparing Berlin Self-Drive Trabi Safari City Tour Prices from leading ticket suppliers and Try to find you Cheap tickets prices on the market. 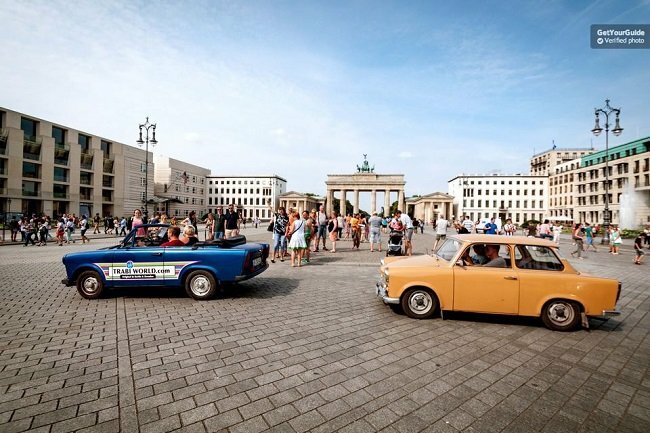 Climb inside your very own Trabant and start exploring the centre of Berlin in a convoy of Classic East Geman Cars. Motor along cobblestone streets, past major monuments and top attractions, seeing the German Capital in a way you never have before. Devoloved in 1957 the Trabant was the answer to an affordable car on the eastern side of the Berlin wall, affectionately doubt ‘the car made of plastic and socialism', the Trabant was light, compact, easily maintained and surprisingly resilient, but it was only after the fall of the Berlin Wall in 1989 when the Trabants really earnt the love of the people. On this 75 minute Trabi Safari you will join with your convoy to cross the former border and drive from East to West, just as thousands of Germans did in Trabants many decades ago. Your tour will be led by an expert local guide who will be in the first Trabi of the convoy. Through the built-in radio you can enjoy a live audio commentary, hear the stories of 20th century Berlin and learn about the sights and streets you drive past. Along the way you will see some of the city's most significant sights including the Berlin Cathedral, Brandenburg Gate, Potsdamer Platz, Checkpoint Charlie, East Side Gallery, the TV Tower, the Oberbaum Bridge and the Unter den Linden. The Berlin Self-Drive Trabi Safari is perfect motor enthusiasts, lovers of antique cars and those looking for a unique and semi-independent tour of Berlin. It has the advantage of exploring the city on a group tour with a knowledgeable guide, while still offering the privacy of your own car. The Trabi Safari is great for small groups and families (up to 4 people). Your Experience With Berlin Self-Drive Trabi Safari City Tour? Explore the German Capital on a novelty 75-minute self-driven Trabi tour. Get behind the wheel of an iconic east German car, the cute and compact Trabant. Learn about the historic city from an English speaking tour guide. Partol the Berlin Wall, pass through Check Point Charlie and cruise to the Brandenburg Gate. See many of Berlin's most interesting features and attractions with your fleet of Trabi driving comrades. Chose the departure time that's best for you, with both morning and afternoon tours on offer. What Berlin Self-Drive Trabi Safari City Tour Includes? Use of Trabant Car for 75 minutes (max 4 persons). Free miles, gas, and third-party insurance including vehicle damage in excess of €300. English speaking guide (in first Trabi) and live commentary in your own car. Novelty Trabi drivers licence for each driver. If you're on short city break then book the morning. This way you'll have all of the afternoon to visit the museums which are located close to Trabi World. Travelers Reviews about Berlin Self-Drive Trabi Safari City Tour? The Trabi Safari has 4.5 out of 5 on TripAdvisor. The tour has an impressive 4.8 out of 5 from Get Your Guide users. This you is a 5-star attraction according to Viator users. Comments agree that this is a fantastic and very fun way to get familiar with the German Capital. Please bring you tickets in paper or electronic form. All tickets are refundable however cancellation fees may apply depending on individual tour provider, please check cancellation policies prior to making your reservation. Drivers must be at least 18 years old and hold a Class B Drivers Licence. All Trabant cars are fitted with manual gearboxes. You will receive some technical instruction before beginning the tour. Children under the age of 15 can join for free, they must be accompanied by an adult. If booking for 2 adults please reserve 2 tickets, you will share one Trabi. If you are 4 adults please reserve 4 tickets, you will receive 2 Trabi's. Meeting Point: Trabi World, under the WELT Baloon, Zimmerstrasse 97/Wilhelmstrasse, Crelin, 10117.